This is a year that we will remember for a sporting achievement that no-one foresaw and most of us could scarcely believe. 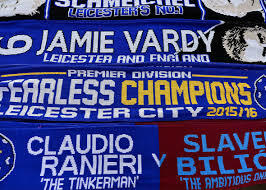 2016 is the year in which to ‘do a Leicester’ will be commemorated in popular history. The little guys triumphed against colossal odds. And that may seem like something far removed from the business of making tyre sealant, but there really are parallels if you look for them. The first is that OKO is proudly made in Leicestershire and the whole factory team has supported its local football club through the hard times (of which there have been many) and the good. And it doesn’t get much better than right now. But on a wider subject, it is the case that the tyre sealant market is made up of many relatively small (some tiny) companies, mostly family-run, and they have for decades had to battle against often harsh attacks from the powers that be – in the shape of tyre makers and rule makers. When first they encounter the product, many peoples’ reaction is that it is snake oil – it’s a trick. How can a liquid sit inside the tyre and then magically become like the tyre rubber itself and properly seal a puncture as soon as it happens? Of course not all sealants are created equal: but despite 38 years of safe and robust operation, OKO still finds itself having to justify the fact that its sealing properties are permanent (that is, as long-lived as the tyres themselves are). The official line from UK motoring organisations and tyre manufacturers alike still is that preventative puncture sealants do not create a permanent repair. The tear strength results were dramatic. The strength of the OKO seal was 7 times greater than that of the plug repair. But most significantly, OKO was 1.62 times stronger than the industry’s standard permanent repair method – vulcanisation. So here we had a medium sized operation – OKO – having developed chemical technology that outdid the giants of the tyre world despite their enormous budgets. That was a few years ago, since when OKO has continued to research and further improve its formulae, working with industry associations like TARRC, the UK-based research arm of the Malaysian Rubber Institute. But in that time, two very significant developments have changed the rules of the game. Firstly, one by one the tyre makers have been patenting preventative puncture sealants of their own. We at OKO have yet to see one of these that gives us any sleepless nights in terms of its effectiveness – however, what it does mean is that the industry has to surrender its claim that tyre sealant cannot work. Thus far, every commercial launch of sealant-filled tyres has failed: but actually if one did catch on it would be very good news for the little boys (i.e. us) because it would become public knowledge that a good tyre sealant is a real safety aid and it does prolong tyre life. That’s what I call a proper game changer. Maybe the relative unknowns, like the Leicester City players a season ago, will have their day in the sun. Secondly, the car makers have all relegated the spare wheel to an optional extra or designed it out completely. Their replacement solution (literally) is to supply a bottle of sealant plus a compressor, nestling in the boot. So now we have the additional endorsement of the vehicle industry that it’s OK to use tyre sealant. And the majority of the population is being made aware of the product’s existence, for the first time in its history. What’s more, there is a growing realisation that original equipment sealant kits and replacements are expensive, and more affordable and superior aftermarket alternatives exist. 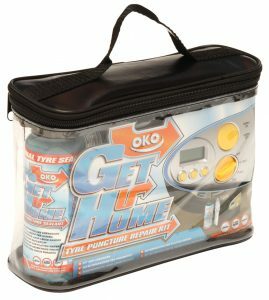 Enter the Foxes from Leicester(shire) with the new OKO Get-u-Home™ emergency compressor/sealant kit, a team that really bonds. Like our adopted football team we are well set to take on European competition, and in our case we already compete worldwide in over 80 countries, hence our claim to offer The World’s Favourite Tyre Sealants.